This is sooooo yummy!!! A few of you out there requested this recipe when I made it at Curie's blessing dinner. Warm up your printers; here it is! Butter 13x9x2-inch glass baking dish. Drain potatoes, then pat dry with kitchen towels. Transfer half of potatoes to prepared baking dish. Use hands to distribute and spread evenly. Sprinkle with half of salt-pepper mixture, then half of herb mixture. Sprinkle with half of cheese. Repeat with remaining potatoes, salt-pepper mixture, herb mixture, and cheese. Pour cream mixture over gratin, pressing lightly to submerge potato mixture as much as possible. DO AHEAD: Can be made 6 hours ahead. Cover with plastic wrap and chill. Remove plastic wrap before baking. 1) I use all Yukon Golds. I'm just not a big sweet potato fan. But I had this at Trisha's when she made it with sweet potatoes, and everyone loved it. 2) I save my oven space for the ham by making this in the slow cooker. I cook it covered on high for three hours, then uncovered for half an hour. 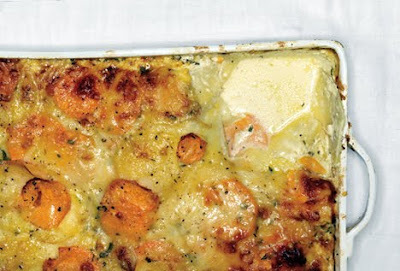 3) You can save yourself $15 on this dish by using Swiss cheese in place of the gruyere. oh my goodness I wish I had seen this before going shopping yesterday!!! I may have to make another trip now, this looks amazing! We got a very late invite to an early Christmas dinner, and I had no time to contemplate what to bring, much less visit the grocery store. I remembered seeing your recipe, and would you believe I had ALL the ingredients on hand(except fresh herbs)??! The dish is cooking now, with a few small changes, and I hope it turns out; we can't wait to try it!